This six prong cathedral engagement ring setting has flowing lines and is designed to sit flush with the wedding band of your choice, complimenting any style. The open gallery also allows the center stone to be visible at all angles. 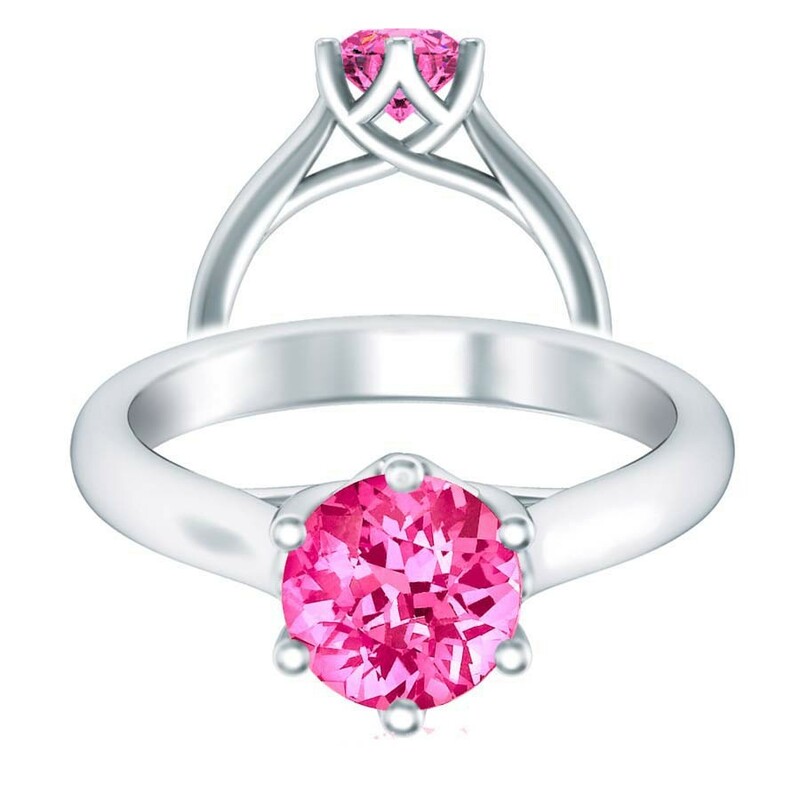 Available with either a 6MM or 6.5MM hand selected round cut pink sapphire center stone. The setting is available in Platinum, White Gold (14K or 18K), Yellow Gold (14K or 18K), Rose Gold (14K) or Palladium and accommodates round stones from .25ct and above. All finished rings will ship within 7 - 10 business days of placing your order since each setting is made specifically for your selected sapphire. For rush orders, please contact us or include comments in the notes section of the check-out process. If you would like this setting customized for a different sapphire shape, please contact us by phone at 312-443-1401 or email [email protected] for pricing. Let us know about your custom jewelry needs. We are Chicagoland’s premier jewelry destination, offering an unprecedented opportunity to create customized jewelry that captures your vision and imagination. At Ethan Lord, we understand how precious and personal your purchase can be. Therefore, our approach includes a private, in-depth consultation, which separates us from your traditional retail jeweler. We devote our time to gain a deep understanding of what you want, to help craft an exquisite one-of-a-kind piece that will be cherished forever. Since 2004, we have dedicated ourselves to providing the finest custom jewelry in the Chicagoland area. Our heritage helps explain how we are able to create such exquisite pieces, and offer them at prices substantially less than you’ll find elsewhere. At Ethan Lord, we manufacture all of our jewelry on site. Not only do we use the finest craftsmanship and technology; our personal consultation, design and planning, combined with the time worn attention to detail, produces superior jewelry that will long be admired and cherished. We just moved into our new location, on Chicago’s “Jeweler’s Row” in April 2014. Our new private client salon at 5 South Wabash, Suite 207, allows us to serve our customers with even more intimacy and care.